Fine Arts Majors Brittany Waseleski and Jackie Lane stand in front of some of the student artwork featured in the Exhibition of Student Work currently on display in The East Wing Gallery in the Raymond LaFontaine Fine Arts Center at the college’s Gardner campus. 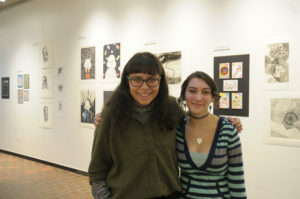 The Mount Wachusett Community College Art Department is celebrating student artwork with a special exhibition of advanced student work that runs until January 25. The Exhibition of Student Work is currently on display in The East Wing Gallery in the Raymond LaFontaine Fine Arts Center at the college’s Gardner campus. The public is encouraged to visit the gallery and take in the outstanding work of 14 students from classes that include Painting 2 and 3 and Drawing 3. The exhibit is an opportunity for students to display a grouping of their work from these advanced classes, said Miller. This differentiates the winter exhibit from the spring student art exhibit which features a much wider array of work from the larger art student body. The gallery hours are Monday through Thursday 3 to 5:30 p.m. and Fridays 8 a.m. to 5 p.m. Additionally, the gallery is always open during performances by Theatre at the Mount. The gallery will be closed on December 24, 25, and 31 as well as January 1 and 21.